Offering a contemporary take on a classic silhouette, the BABBLE sandal is a fashion-focused option that will take you from deskbound days to dancing nights! 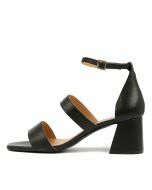 Crafted in Spain, this soft leather design features a strappy silhouette with an on-trend square toe shape and an angled block heel. A staple style for all seasons, this versatile piece can be worn with skirts, dresses and denim!